Draft: 2006, New York Yankees, 5th rd. A native of Chicago, George signed a minor league contract with an invite to major league Spring Training in January of this season ... has appeared in eight major league seasons with the Yankees (2011, 2018), Giants (2012-17), Pirates (2017-18) and Indians (2018), going 18-18 with a 3.10 ERA (123 ER/357.0 IP) in 350 appearances, all out of the bullpen ... From 2014-16, he went 11-6 with a 2.49 ERA (44 ER/159.0 IP) in 154 relief outings with San Francisco ... Attended Northwestern University ... ranked second in the Big Ten with 84 strikeouts in 2006 ... Is a 2003 graduate of Niles (Ill.) West High School, where he was named the Illinois High School baseball Player of the Year in 2003 ... also lettered in golf and basketball ... His father was born in Greece ... represented Greece as a 16-year-old in 2001 in a Pan-European baseball tournament in Thessaloniki. George appeared in 28 major league contests between the Pirates, Indians and Yankees, going 2-3 with a 4.39 ERA (13 ER/26.2 IP) ... marked his fewest major league appearances since the 2011 season ... Began the season with Pittsburgh, going 2-3 with a 5.03 ERA (11 ER/19.2 IP) in 21 relief outings ... was designated for assignment May 25 and released three days later ... Signed a minor league contract with Cleveland, June 2 ... posted a 1.13 ERA (2 ER/16.0 IP) in 14 relief outings with Triple-A Columbus and a 3.38 ERA (2 ER/5.1 IP) in six games with the Indians ... was designated for assignment, July 6 ... Acquired by the Yankees, August 4 ... appeared in eight games with Triple-A Scranton/Wilkes-Barre (3 ER/8.1 IP) and made one scoreless outing with the Yankees (1.2 IP). Went 1-6 with a 3.39 ERA (66.1ip/27r/25er) and 70 strikeouts in 65 total games between San Francisco and Pittsburgh...Began season with San Francisco and was scored upon once in his first six appearances...Was charged with his first loss (0.2ip/3r) on 4/7 at San Diego...Posted a 1.93 ERA (14.0ip/3er) in 12 appearances during the month of May and a 1.26 ERA (14.1ip/2er) in June...Had 33 inherited runners while playing with the Giants; the fifth-most among National League relievers at the time he was acquired by Pittsburgh...Made final appearance with San Francisco on 8/2 vs. Oakland (1.0ip/0r)...His 50 appearances with the Giants were tied for the eighth-most in the National League at the time he was claimed off waivers by Pittsburgh on 8/5...Made debut with the Pirates on 8/7 vs. Detroit and tossed a scoreless eighth inning...Retired each of the nine batters he faced in his first three appearances with Pittsburgh... Surrendered a game-tying home run to Keon Broxton in the seventh inning on 8/16 at Milwaukee and suffered a blown save... Was placed on the 10-day disabled list on 8/22 (retro to 8/20) with a right groin strain...Threw a 30-pitch bullpen session at PNC Park on 9/3 and had a 20-pitch simulated game on 9/5...Was reinstated on 9/7...Suffered his loss with Pittsburgh on 9/9 at St. Louis...Won his lone game on 9/30 at Washington - his first big league win since 8/8/16...Recorded his first Major League save in the final game of the season on 10/1 at Washington...Produced a 1.72 ERA (15.2ip/3er) and 16 strikeouts in his final 16 games, dating back to 8/2. Finished the season with a record of 3-2 and a 2.53 ERA in 57 appearances. Missed 26 games from April 19-May 17 with a flexor strain in his pitching arm, an injury similar to the one that shelved reliever Sergio Romo. Kontos had felt something in his elbow in spring training and after undergoing test on April 18 he was shut down. Appeared in eight of the team's first 13 games and produced a 1.59 ERA before going on the DL. Was removed from the 15-day disabled list on May 17 after making four rehab appearances with triple-A Sacramento (1er, 3.2ip). Had his best big league season, going 4-4 with a 2.33 ERA in a career-high 73 relief appearances....Posted career highs in games, innings pitched (73.1) and his ERA and WHIP (0.94) were both the lowest of his five-year career....13 of his 20 runs allowed came off home runs....Stranded his first 26 inherited runners before allowing his first such runner to score July 24 vs. OAK...stranded 41/54 runners (75.9%)....Fashioned a 1.38 ERA (5er, 32.2ip) at home compared to a 3.10 figure (14er, 40.2ip) on the road....Held right-handed batters to a .205 clip (35-for-171)....Limited opponents to a .159 average (13-for-82) with RISP and .073 (3-for-41) with RISP/2 outs....The only relievers in the big leagues with a lower opponents batting average against with RISP were New York's (AL) Dellin Betances (.115) and Chicago's (NL) Hector Rondon (.143) (minimum of 75 opponent at-bats with RISP). Spent the season bouncing back and forth between Triple- A Fresno and San Francisco, being recalled to the big league club five different times...Went 4-0 with a 2.78 ERA (10er, 32.1ip) in 24 relief appearances for the Giants, with 14 of 24 outings being multiple innings...Won back-to-back games July 21-22, earning wins at Philadelphia in which he totaled 4.1 innings while allowing one run on 61 pitches...Began the season at triple-A Fresno where he compiled a 3-3 record with a 2.08 ERA (11er, 47.2ip) along with four saves in 30 relief appearances...Struck out 58 batters while allowing 11 walks and held PCL batters to a .228 average against...Fanned at least one batter in every game but two, with multiple strikeouts in 20 of 30 games...Ended his triple-A season Aug. 15 with a 19.0-inning scoreless streak (June 28-Aug. 15). Completed his second season with San Francisco and appeared in 52 games, going 2-2 with a 4.39 ERA (27er,55.1ip). Fashioned a 2.43 ERA at home, but posted a 6.66 figure on the road.Received a three-game suspension and an undisclosed fine for intentionally throwing a pitch at the Pirates' Andrew McCutchen on June 11 at PNC Park. Finished the season strong, posting a 1.00 ERA (1er, 9.0ip) over his last 10 appearances.Despite spending over a month with Fresno, his 52 appearances out of the Giants' bullpen were the fifthmost on the club. Appeared in 18 games for triple-A Fresno, going 3-2 with a 4.18 ERA (11er, 23.2ip). Rookie right-hander was integral part of Giants'bullpen, going 2-1 with a 2.47 ERA (12er, 43.2ip) along with 44 strikeouts against 12 walks in 44relief outings. Among rookie relievers he was tied for sixth in games, seventh in innings and strikeouts. Was acquired by the Giants from the Yankees on April 4 in exchange for C Chris Stewart. Was recalled from triple-A Fresno on June 9 and spent the remainder of the year in SF's 'pen. Left-handed hitters batted just .167 (9-for-54) off him with one extra base hit (one HR). Held the opposition scoreless in 14 of his last 17 outings (4er, 15.2ip, 2.30 ERA). Earned his first Major League win on Aug. 29 at Houston tossing 2.2-scoreless innings with four strikeouts. Posted a 3.00 ERA (6.0IP, 2ER) without recording a decision in seven relief appearanceswith the Yankees as a September callup...retired five of his six first batters faced andprevented each of his six inherited runners from scoring... held opponents scorelessin five of his appearances... Was signed to a Major League contract and selected to the Yankees' active rosterfrom Triple-A Scranton/Wilkes-Barre on 9/6...made his Major League debut in 9/10loss at Los Angeles-AL, allowing 2H and 1ER in 1.1IP (2K, 1HR)... did not face an officialbatter in 9/18 loss at Toronto after Lawrie was caught stealing second base to endthe inning... Entered 9/22 loss vs. Tampa Bay with the bases loaded and struck out Justin Ruggianoto strand all three runners (1.1IP, 1H, 1K)... Prior to his call-up, went 4-4 with two saves and a 2.62 ERA (89.1IP, 26ER) in 40appearances (four starts) at Scranton/WB...was 1-0 with a 2.08 ERA (17.1IP, 4ER) infour starts and 3-4 with a 2.75 ERA (72.0IP, 22ER) in 36 relief appearances...tossedat least 2.0 innings in 21 of his 36 relief outings, including six appearances of at least3.0 innings and two with at least 4.0IP... Was returned to the Yankees from the Padres on 3/14/11 after being selected in the2010 Rule 5 Draft. Split his time between three levels in the NYY organization, seeing time at Single-A Tampa, Double-A Trenton, and Triple-A Scranton/Wilkes-Barre...Combined to go 0-4 with a 3.60 ERA (18 ER/45.0 IP) in 24 games (two starts)...tallied 38 strikeouts compared to 15 walks...Served primarily as a reliever for the first time in his career, having made two relief appearances prior to the 2010 campaign...Selected by the Padres in the Rule 5 draft following the season...11th player selected overall in the draft. Combined to go 4-5 with a 3.15 ERA (25 ER/71.1 IP) in 13 starts between Double-A Trenton andTriple-A Scranton/Wilkes-Barre...Began the season with Trenton, going 1-1 in four starts before being promoted to Triple-A on 5/4...Tossed his first career complete game 6/6 at Charlotte...tagged with the loss despite allowing just four hits and three runs (two earned) over 8.0 innings...Placed on the disabled list 6/26 with a strained right biceps, missing the remainder of the season. Made a team-high 27 starts for Double-A Trenton, going 6-11 with a 3.68 ERA...Led his team with 152 strikeouts and 151.2 innings pitched...Led all Yankees minor leaguers and ranked third in the Eastern League with a .239 opponent batting average...limited left-handers to a .212 average...Named Eastern League Pitcher of the Week for the week ending 8/3. Made 19 appearances (17 starts) for Single-A Tampa...missed time while on the disabled list from4/19-6/13 with a right shoulder contusion...Recorded a career-high 11 strikeouts in 6.1 innings of work 4/17 vs. Clearwater...Pitched for the Honolulu Sharks of the Hawaiian Winter Baseball League following the season. Made his professional debut with Short-A Staten Island, going 7-3 with a 2.46 ERA (23 ER/78.1IP) in 14 starts...Ranked third among all New York-Penn League pitchers with 82 strikeouts...Won seven consecutive decisions from 7/8-8/17...Named to the Baseball America Minor League Short-Season All-Star Team. 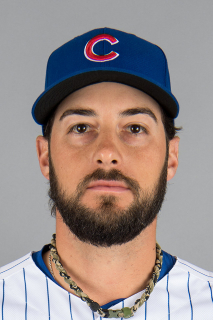 February 6, 2019 RHP George Kontos assigned to Iowa Cubs. January 25, 2019 Chicago Cubs signed free agent RHP George Kontos to a minor league contract and invited him to spring training. October 5, 2018 RHP George Kontos elected free agency. August 17, 2018 New York Yankees sent RHP George Kontos outright to Scranton/Wilkes-Barre RailRiders. August 15, 2018 New York Yankees designated RHP George Kontos for assignment. August 13, 2018 New York Yankees selected the contract of RHP George Kontos from Scranton/Wilkes-Barre RailRiders. August 4, 2018 Cleveland Indians traded RHP George Kontos to New York Yankees for cash. August 4, 2018 RHP George Kontos assigned to Scranton/Wilkes-Barre RailRiders. July 8, 2018 Cleveland Indians sent RHP George Kontos outright to Columbus Clippers. July 6, 2018 Cleveland Indians designated George Kontos for assignment. June 19, 2018 Cleveland Indians selected the contract of RHP George Kontos from Columbus Clippers. June 3, 2018 Cleveland Indians signed free agent RHP George Kontos to a minor league contract. June 3, 2018 RHP George Kontos assigned to Columbus Clippers. May 28, 2018 Pittsburgh Pirates released RHP George Kontos. May 25, 2018 Pittsburgh Pirates designated RHP George Kontos for assignment. September 7, 2017 Pittsburgh Pirates activated RHP George Kontos from the 10-day disabled list. August 22, 2017 Pittsburgh Pirates placed RHP George Kontos on the 10-day disabled list retroactive to August 20, 2017. Right groin strain. August 7, 2017 Pittsburgh Pirates activated RHP George Kontos. August 5, 2017 Pittsburgh Pirates claimed RHP George Kontos off waivers from San Francisco Giants. May 17, 2016 San Francisco Giants activated RHP George Kontos from the 15-day disabled list. May 8, 2016 San Francisco Giants sent RHP George Kontos on a rehab assignment to Sacramento River Cats. October 30, 2014 San Francisco Giants activated RHP George Kontos. October 1, 2014 San Francisco Giants reassigned RHP George Kontos to the minor leagues. August 25, 2014 San Francisco Giants recalled RHP George Kontos from Fresno Grizzlies. August 22, 2014 San Francisco Giants optioned RHP George Kontos to Fresno Grizzlies. August 22, 2014 Fresno Grizzlies activated RHP George Kontos. August 21, 2014 San Francisco Giants recalled George Kontos from Fresno Grizzlies. July 27, 2014 San Francisco Giants optioned RHP George Kontos to Fresno Grizzlies. July 21, 2014 San Francisco Giants recalled George Kontos from Fresno Grizzlies. June 16, 2014 San Francisco Giants optioned RHP George Kontos to Fresno Grizzlies. May 22, 2014 San Francisco Giants recalled George Kontos from Fresno Grizzlies. May 10, 2014 San Francisco Giants optioned RHP George Kontos to Fresno Grizzlies. May 6, 2014 San Francisco Giants recalled George Kontos from Fresno Grizzlies. March 23, 2014 San Francisco Giants optioned RHP George Kontos to Fresno Grizzlies. September 3, 2013 San Francisco Giants recalled George Kontos from Fresno Grizzlies. July 23, 2013 San Francisco Giants optioned George Kontos to Fresno Grizzlies. July 11, 2013 George Kontos roster status changed by San Francisco Giants. June 24, 2013 San Francisco Giants recalled George Kontos from Fresno Grizzlies. June 12, 2013 San Francisco Giants optioned George Kontos to Fresno Grizzlies. June 9, 2012 San Francisco Giants recalled George Kontos from Fresno Grizzlies. April 4, 2012 New York Yankees traded RHP George Kontos to San Francisco Giants for C Chris Stewart. April 4, 2012 San Francisco Giants optioned George Kontos to Fresno Grizzlies. March 20, 2012 New York Yankees optioned RHP George Kontos to Scranton/Wilkes-Barre Yankees. October 7, 2011 George Kontos roster status changed by New York Yankees. September 30, 2011 New York Yankees reassigned RHP George Kontos to the minor leagues. September 6, 2011 New York Yankees selected the contract of RHP George Kontos from Scranton/Wilkes-Barre Yankees. March 14, 2011 George Kontos returned to Scranton/Wilkes-Barre Yankees from San Diego Padres. December 9, 2010 San Diego Padres claimed George Kontos off waivers from Scranton/Wilkes-Barre Yankees. September 1, 2010 George Kontos assigned to Scranton/Wilkes-Barre Yankees from Trenton Thunder. August 31, 2010 George Kontos assigned to Phoenix Desert Dogs. July 6, 2010 George Kontos assigned to Trenton Thunder from Tampa Yankees. June 18, 2010 George Kontos assigned to Tampa Yankees from Scranton/Wilkes-Barre Yankees. April 8, 2010 George Kontos roster status changed by Scranton/Wilkes-Barre Yankees. September 21, 2009 Scranton/Wilkes-Barre Yankees activated RHP George Kontos from the 7-day disabled list. June 26, 2009 Scranton/Wilkes-Barre Yankees placed RHP George Kontos on the 7-day disabled list. May 3, 2009 RHP George Kontos assigned to Scranton/Wilkes-Barre Yankees from Trenton Thunder. June 16, 2006 New York Yankees signed RHP George Kontos.